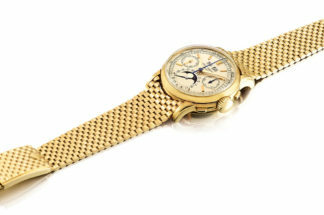 Home Stories Auctions The Patek Philippe ref. 5970 — Time to Buy? Here’s a page straight out of the playbook of one of Patek Philippe’s brightest, Mr. Thierry Stern: Design an incredibly desirable watch — superbly balanced and legible dial; a modern day triumph in case proportions — and produce it in white and pink gold for the first four years of its life; get everyone on the field going. Add a yellow one to the mix in the fourth year, but produce it only for that fourth year; now you’ve got everyone’s eyebrows well and raised. Stop production of all gold versions and issue a deep black dialed platinum version in the fifth year and at the end of the sixth year, put it out of production; now you’ve got the world’s jaws, firmly, planted on the floor. Game over. 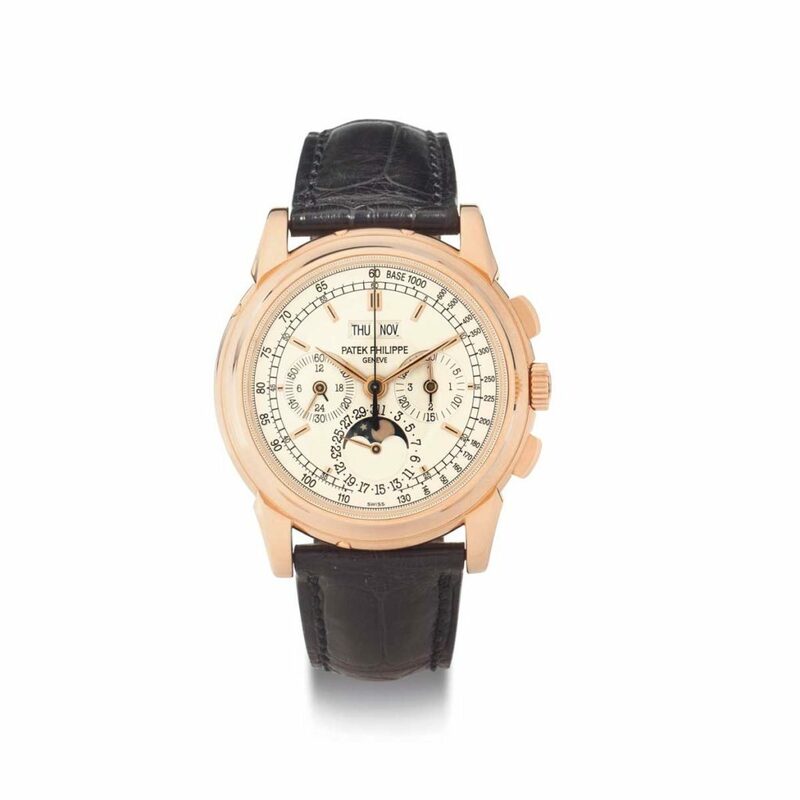 That — in a nut shell — is the story of the 5970, Patek Philippe’s last perpetual chronograph that had the venerable Lemania 2310 beating within it. The watch was first introduced in 2004, in pink and white gold. Later in its fourth year, a yellow gold version was added to the rank. At the close of 2008, Patek Philippe stopped production of all gold variations of the 5970 and instead began producing a platinum version in 2009. And, of course, you already know what came next: At the end of 2010, the 5970 was shockingly retired from production. The 5970 succeeded the 3970 (1986-2004) and was first produced in pink and white gold from 2004 to 2008. The timepiece would also become the last of Patek Philippe’s perpetual calendar chronographs to be powered by the Lemania 2310 based, CH27 movement. 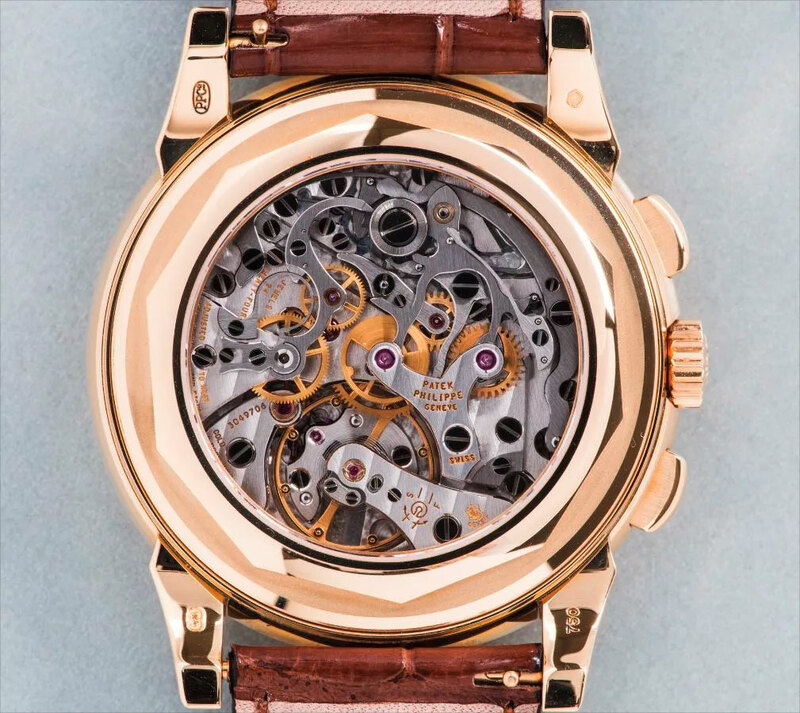 The yellow gold variation of the 5970 was introduced in 2008 and produced in that year only, which therefore makes the yellow gold 5970 the rarest variation of the watch that was serially produced. The platinum 5970 was serially produced for just two years from 2009 through to 2010. There were a handful of 5970s produced in 2011, with the “end-of-series” dial, which included unusual dial and case combinations. 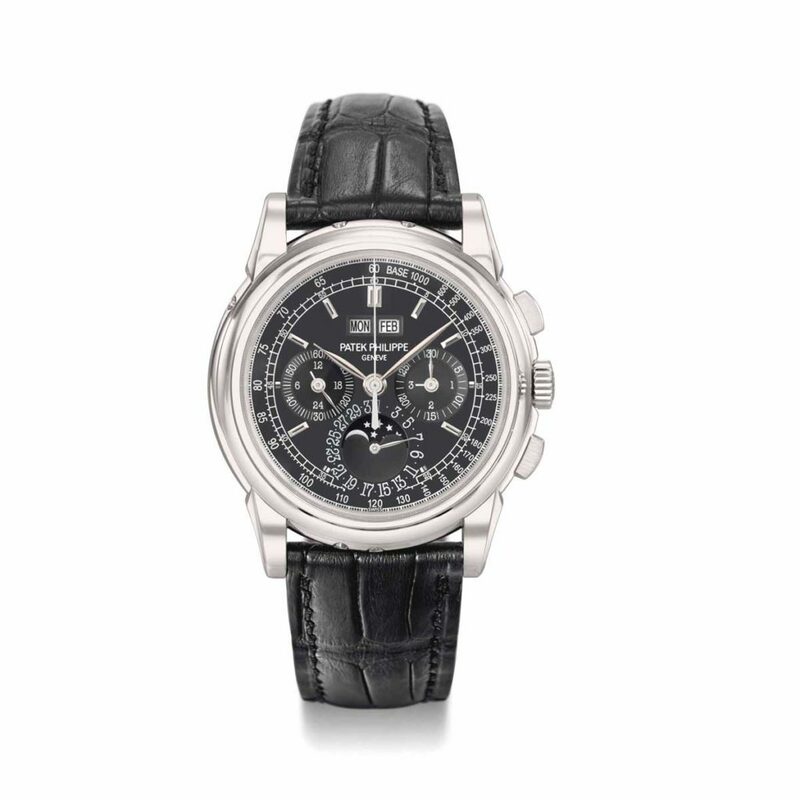 There were, also, made-to-order versions of the 5970 upon requests made by Patek Philippe’s top most clients. 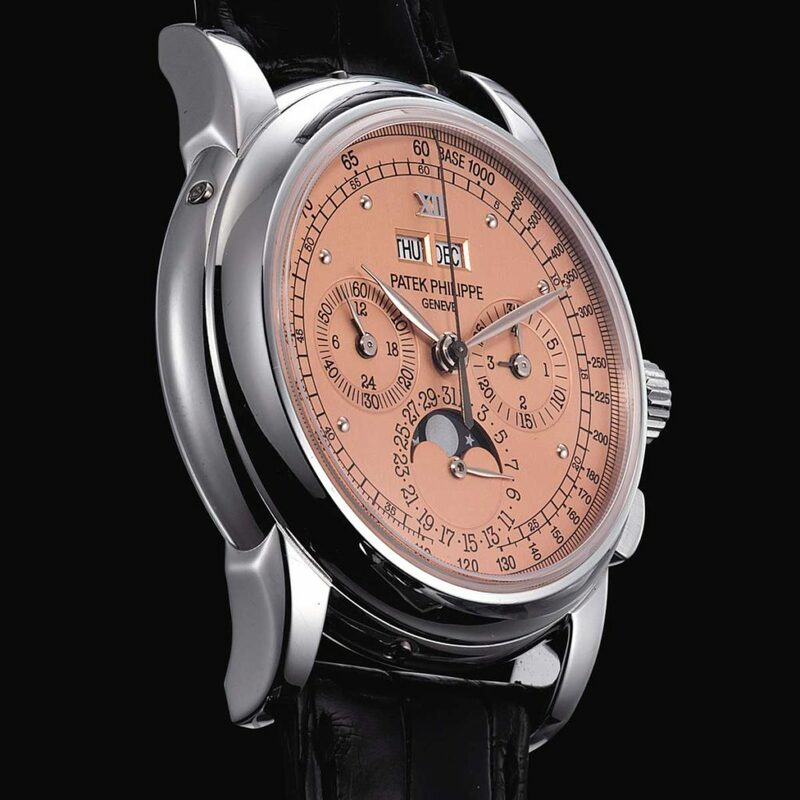 The Lemania 2310 base chronograph movement, which was developed into the CH 27-70 Q perpetual calendar chronograph movement by Patek Philippe, for the 3970 and later the 5970, is the same chronograph movement that you would find inside of the Speedmaster Professional of 1965 to 1968; the same movement you would find in the Audemars Piguet Jules Audemars Tourbillon Chronograph, the 1990s Vacheron Constantin Les Historiques chronograph and again, Patek Philippe’s own 5004 perpetual calendar split-second chronograph. The latest addition to these ranks is the Vacheron Constantin Historiques Cornes de vache 1955, introduced at Watches & Wonders, Hong Kong 2015. Meaning to say, the CH 27 has not only been employed by the three biggest names in the industry, but it’s also the movement that’s gone to the moon and back, thanks to Omega. Read more about the Lemania 2310, more lovingly referred to as the CH 27, here. Six years, that’s how short the production lifecycle of the 5970 was. To put things into perspective, its predecessor, the 3970, was in production for 18 years (1986-2004) with some 4,200 pieces produced in gold (yellow, white and pink) and platinum. 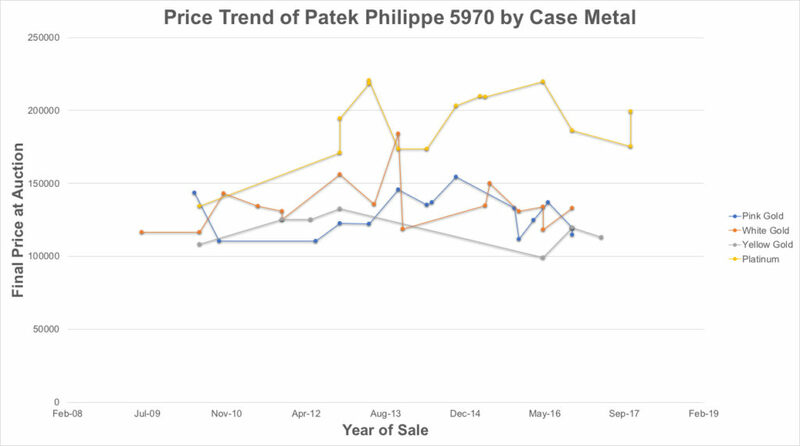 Patek Philippe’s not been the most forth coming about the total number of 5970s ever produced. But considering that it was in production for a third of the time the 3970 was, it’s not hard to imagine that probably only half as many 5970s were produced in its lifetime — or worse, only a third. Experts in the field have suggested that realistically there were 2,800 5970s made in its lifetime. It could be, that the final number of 5970s produced is a difficult number to publicly announce, because in the lifetime of the watch, Patek Philippe produced made-to-order pieces for the very highest rungs of their clientele. 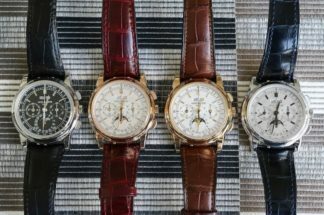 Not to mention that in 2011 — after the watch was put out of production — Patek Philippe produced yet another handful, known as the “end-of-series” 5970s. Read about some of these special 5970s in Nick Foulkes brilliant piece, here. Regardless of that magic number, the fact remains: Six years of production, logically means, the final number of 5970s out there in the world is very small, with the yellow gold being the rarest, the platinum next and the pink and white gold being the most “common”. You’d think then that given such rarity, the 5970 would be pulling in blockbuster prices at auctions. On the contrary, prices have frankly been steady and below the 2004 introductory prices, starting at US$150,000. Disregarding the pièce unique instances, sure there seemed to be a slight spike in the average prices in 2012 through to 2013 — particularly with a few platinum pieces reaching well above the US$200,000 mark — in 2016 and 2017, prices have held well within US$130,000-150,000. 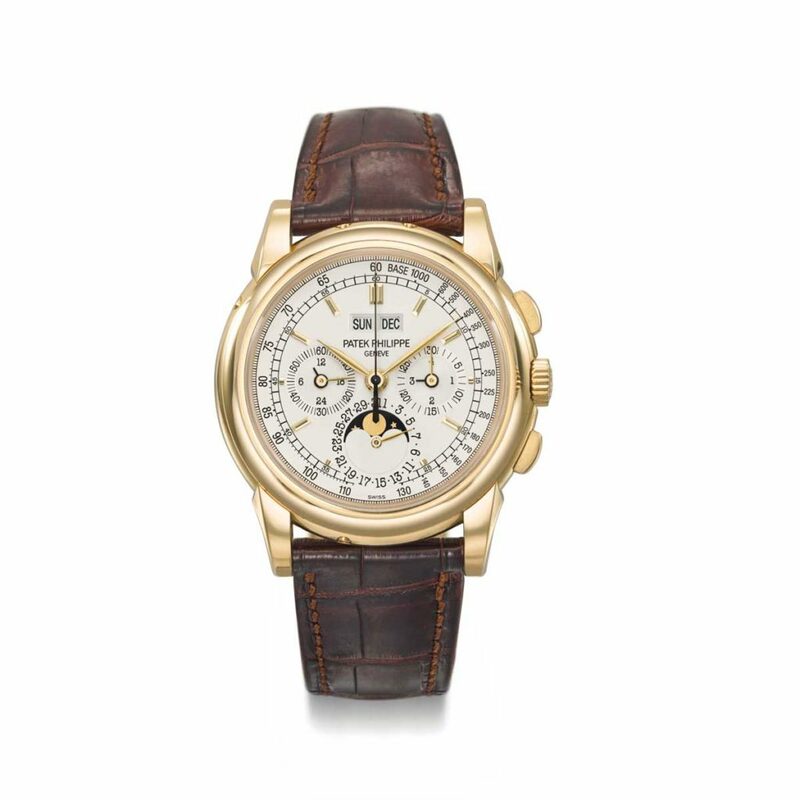 In fact, at Phillips Watches The Hong Kong Watch Auction: TWO (May 2016), some lucky son of a — you know what — walked away with a yellow gold 5970 for HK$775,000 (approximately US$99,000). Let’s be reminded now that the yellow gold 5970 was produced for just one year. 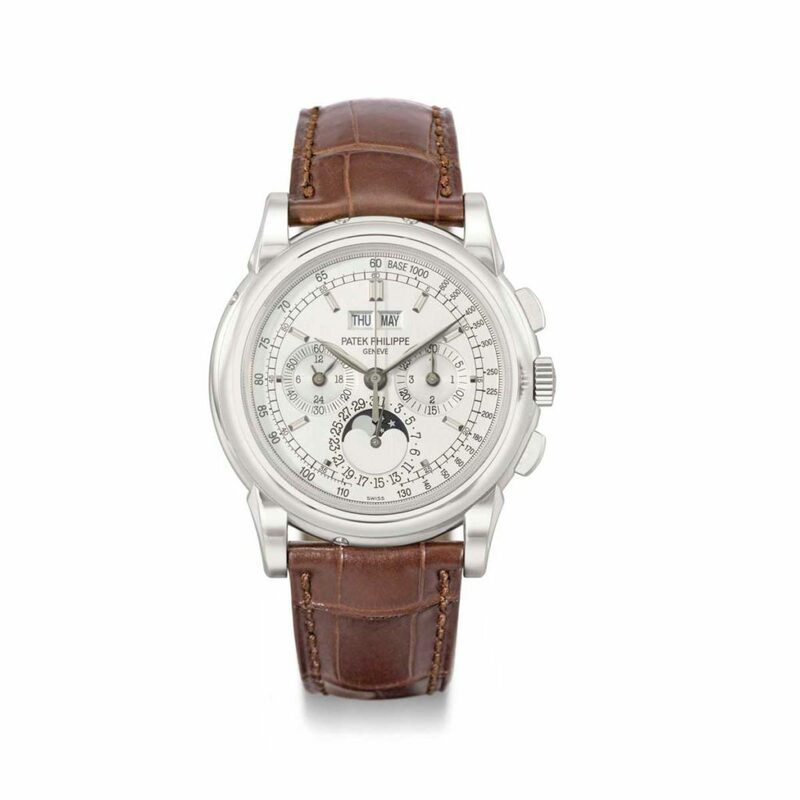 Point is, for the place that the watch holds in the story of Patek Philippe’s linage of perpetual calendar chronographs, at present, the 5970 is undervalued — dare I say — to be had at a bargain. But don’t take my measly words for it. Says Wei Koh, Revolution’s Founding Editor, “Looking at its long-term potential, I feel Patek Philippe’s 5970 is one of the best investments today. It’s rarer than the 3970. It’s one of the most beautiful watches Patek has ever made. So, to answer the question we started off with: Buy. Buy now.